A toothache means a tooth has a problem, right? Most of the time, yes: the pain comes from a decayed or fractured tooth, or possibly a gum infection causing tooth sensitivity. Sometimes, though, the pain doesn't originate with your teeth and gums. They're fine and healthy—it's something outside of your tooth causing the pain. We call this referred pain—one part of your body is sending or referring pain to another part, in this instance around your mouth. There are various conditions that can create referred pain in the mouth, and various ways to treat them. That's why you should first find out the cause, which will indicate what treatment course to take. Here are a few common non-dental causes for tooth pain. Trigeminal Neuralgia. The trigeminal nerves situated on either side of the face have three large branches that extend throughout the face; the branch to the jaw allows you to feel sensation as you chew. When one of the nerve branches becomes inflamed, usually from a blood vessel or muscle spasm pressing on it, it can refer the pain to the jaw and seem like a toothache. Temporomandibular Joint Disorder (TMD). These two joints that connect the lower jaw to the skull can sometimes become dysfunctional for a variety of reasons. This can set up a cycle of spasms and pain that can radiate throughout the jaw and its associated muscles. The pain can mimic a toothache, when it actually originates in the jaw joints. Teeth Grinding. This is an unconscious habit, often occurring at night, in which people clench or grind their teeth together. Although quite common in children who tend to grow out of it, teeth grinding can continue into adulthood. The abnormally high biting forces from this habit can cause chipped, broken or loosened teeth. But it can also cause jaw pain, headaches and tenderness in the mouth that might feel like a toothache. 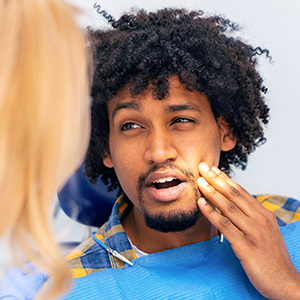 These and other conditions unrelated to dental disease can seem like a tooth problem, when they're actually something else. By understanding exactly why you're feeling pain, we can then focus on the true problem to bring relief to your life. If you would like more information on oral pain issues, please contact us or schedule an appointment for a consultation. Drugs play an indispensable role in treating disease. For example, life without antibiotics would be much more precarious—common infections we think nothing of now would suddenly become life-threatening. But even the most beneficial drug can have disruptive side effects. Antibiotics in particular can cause a rare but still disturbing one: a growth on the tongue that at first glance looks like dark hair. In fact, it's often called "black hairy tongue." It isn't hair—it's an overgrowth of naturally occurring structures on the tongue called filiform papillae. These tiny bumps on the tongue's upper surface help grip food while you're chewing. They're normally about a millimeter in length and tend to be scraped down in the normal course of eating. As they're constantly growing, they replenish quickly. We're not sure how it occurs, but it seems with a small portion of the population the normal growth patterns of the papillae become unbalanced after taking antibiotics, particularly those in the tetracycline family. Smoking and poor oral hygiene also seem to contribute to this growth imbalance. As a result, the papillae can grow as long as 18 millimeters with thin shafts resembling hair. It's also common for food debris and bacteria to adhere to this mass and discolor it in shades of yellow, green, brown or black. While it's appearance can be bizarre or even frightening, it's not health-threatening. It's mostly remedied by removing the original cause, such as changing to a different antibiotic or quitting smoking, and gently cleaning the tongue everyday by brushing it or using a tongue scraper you can obtain from a pharmacy. One word of caution: don't stop any medication you suspect of a side effect without first discussing it with your prescribing doctor. While effects like black hairy tongue are unpleasant, they're not harmful—and you don't want to interfere with treatments for problems that truly are. If you would like more information on reactions to medication that might affect your oral health, please contact us or schedule an appointment for a consultation. A beautiful smile is a balanced smile, especially in regard to your gums. A normal smile usually shows 4 mm or less of gum tissue along with about 10 mm of tooth length. 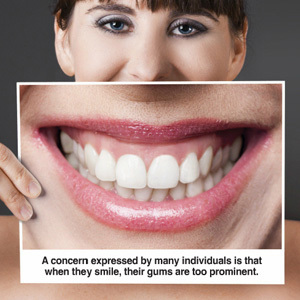 But if your gums show more than that, your smile may seem too gummy. In terms of perceived balance, this could detract from your smile's attractiveness. Fortunately, you don't have to live with a gummy smile—there are various ways to correct or minimize its effect. First, though, we'll need to determine the underlying cause before deciding on the best treatment. And, there are several possible causes, the obvious being too much gum tissue present. Teeth that appear shorter due to wear or incomplete eruption could also make the gums appear larger. We may be able to correct these size problems by surgically removing and reshaping excess gum tissues and possibly the underlying bone to reveal more of the teeth. We can also bond composite resins or porcelain veneers to shorter teeth to make them appear larger. But not all gummy smile problems pertain directly to the teeth and gums; instead, it could be your upper lip moves too far up as you smile (hypermobility). 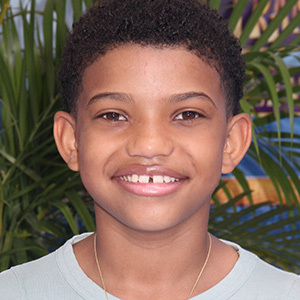 Or, your upper jaw may be too long for your face, which can also cause too much of the gums to show during smiling. With upper lip hypermobility, we may be able to inhibit the lip muscles' movement temporarily with Botox injections that partially paralyze the muscles (the effect eventually wears off, so this treatment will need to be repeated). A periodontist, an oral surgeon, or a plastic surgeon could also permanently alter the upper lip movement through a surgical procedure. Surgery may also be necessary for an abnormally long upper jaw: orthognathic surgery re-positions the jaw to the skull, which can lessen the amount of gums showing. If your smile is too gummy, we can transform it. But first, let's find out what the real cause is with a comprehensive dental examination. Once we know, we can better advise you on the best way to bring beautiful balance to your smile. The healthiest tooth restoration method available, dental implants feel, look, and act just like real teeth. At Western Slope Dental Center in Grand Junction, CO, Dr. Brandon Berguin, Dr. Kira Funderburk and Dr. William Berguin complete gapped smiles with innovative implants to replace one, two, or all of a patient's teeth. Get the details here! No decay, no gum disease, no gaps. However, problems can crop up from time to time—even tooth loss, no matter how hard we work to avoid it. Along with tooth loss comes gum and bone degradation which changes how your face looks and how healthy your remaining teeth are as time goes by. Dental implants from your dentist in Grand Junction imitate what those lost teeth used to do for you, allowing you to bite, chew, and speak without worry or the need for messy denture adhesives. How can a titanium screw, metal post, and porcelain crown do all that? The key is titanium metal. Human bone loves it and readily bonds to it through osseointegration. As an implant site heals, the surgically-placed device and the jaw bone meld securely and permanently, acting just as a natural tooth root does. While osseointegration does take time, the results are fantastic and reliable. Dental implants can last for 40 to 50 years, and few things threaten their reliability. Just keep up with your good at-home hygiene, and come to Western Slope Dental Center for check-ups and cleanings twice a year. Additionally, avoid grinding your teeth and smoking, and your implants will stay safe, secure, and totally functional! Not at all! It simply takes a consultation, an operation, and a followup. Your dentist will tell you if you are a good candidate for this inventive tooth replacement. Expect a complete oral examination, digital X-ray imaging, and a thorough assessment of your jaw bone, for you must have enough bone to accept the implant. If your bone is thin, you may need to undergo a simple augmentation procedure to strengthen the jaw bone before your implant treatment. For a single-tooth implant, your dentist will numb the site and insert the titanium device directly into the jaw bone. You will then wait several weeks before returning to the office for placement of the post and crown. At that time, your implant will be fully integrated and usable. For additional information and to arrange your appointment with us, call our Grand Junction office at (970) 241-3483. You can have a great smile again with dental implants!